Genuine dill pickles are made with cucumbers, dill weed, spices, salt (or dilute salt brine) and vinegar and are then handled in such a manner as to encourage a lactic fermentation. As the manufacturing of genuine dills is a seasonal problem, it is often quite difficult for any manufacturer to forecast his needs and accordingly pack the amount needed for his future orders. He will often endeavor to calculate his needs and pack accordingly. He may take the amount he has packed in the past and therefrom strike an average for several years which will be his basis for packing. He may endeavor to pack his required amount for orders and future business, but climatic conditions may control the growth and development to such an extent that there may be quite a scarcity of pickles, so that in order to fill all orders, he feels that he must make imitation dills, and believes that he is at liberty to sell them as genuine without informing the trade as to the difference. His business may develop to such an extent that his season pack is exhausted early in the fall of that pack, leaving him with none to fill his winter and spring orders. Of course he may go out on the open market and buy genuine dills to replenish his stock but would prefer having his own stock for several reasons; first, his customers may have been educated to the flavor of the pickle he packs and, second, he can usually make more money on his own pack as he does not have to pay the middleman's commission or profit to the original packer. Again nature may step in and destroy the supply of pickles by drought, insects and bacterial contamination to such an extent that the percentage of yield is far below his needs and he is compelled to buy on the market for his orders. It is these manufacturing differences that have at times hurt the sale of genuine dills. Often an inferior flavored pickle is packed and sold and its sale does not help to improve the trade in this commodity. There is often quite a difference in the flavor of dill pickles. While some have a crisp, delicious, appetizing, slightly sour dill flavor, others are soft, with no acid taste and a very poor dill flavor. A genuine dill pickle is a credit to any manufacturer but a poor dill is no credit to any one but rather a handicap. The packing season for dills is often of 'so short a duration that vast quantities must of necessity be handled within a short time, requiring almost day and night barreling in order to obtain the quantity necessary for orders. The quantity of pickles coming into a salting station may be so great as to swamp the pickle station to such an extent that it is compelled to put the pickles down in heavy salt brine. Time is often an important factor and as genuine dills, even when packed in tanks, require more time to handle, necessity may compel the surplus to be handled for salt stock. For many reasons dills are packed in barrels. Early and late in the season the pickle receipts may be so small that they could not be handled otherwise without great losses. Due to the rapid spoilage of dills, they must have the air excluded as much as possible and certainly need constant attention when processed in tanks to see that the scum is removed and the pickles kept under the brine, thus preventing decomposition. So far the packing of dills in tanks in large quantities has not be a commercial success. To pack quality dills, cucumbers that are firm, sound, free from blemishes, spot rot, wilt, sack spot, insect bites, etc., must be used. The cucumbers are usually delivered to the stations in slatted boxes and baskets. They are then sorted and the proper size for dills is removed and the other vat run pickles are salted heavily for regular salt stock. The protein and ash (minerals) are used as food by the bacteria which also act on the sugar present (which is invert), and are easily fermented into lactic acid. Due to climatic conditions such as rain or drought, heat or cold, and soil conditions, such as poor, rich, fertilized, or unfertilized, selection of seed which may give good yields in one section and poor yields in another affects the composition and causes it to vary greatly. The sugar present is in a condition to be easily acted upon by the bacteria as well as the yeast, forming alcohol, lactic, acetic, and butyric acids. The percentage of lactic acid developed depends greatly upon the amount of fermentable sugar present. The greater the percentage of sugar, the greater the per- centage of acid produced. When pickles are deficient in sugar, then a fermentable one such as glucose, corn sugar, or dextrose may be added at the rate of from 2 to 5 pounds per barrel of pickles. This may be one way of using dextrose without causing any special litigation or trade ruling. The natural, desirable fermentation is the lactic which produces lactic acid and preserves the pickles from destructive decomposition by objectionable bacteria. If all of the sugar present in the pickles should be fermented into lactic acid then there would be % of 1 per cent lactic acid for each 1 per cent of fermentable sugar. But other bacteria and yeast act on the sugar and break it down into compounds other than lactic acid. One must, therefore, be careful not to add too much sugar and encourage wild yeast to start a too active fermentation and utilize all the sugar in an alcoholic fermentation, rather than in the production of lactic acid which is so desirable. After sorting out the proper size pickles for dills, they are placed in clean-washed or steamed barrels. Any good clean barrels that are used for packing other foods can be used. Of course barrels that have been used for oil or fish cannot be used. It was the practice of many of the old packers to use whisky barrels after scraping out the charcoal but these barrels cannot be easily obtained now. Barrels that have been used for vinegar can be used as the vinegar is not objectionable because the acetic acid checks the development of foreign bacteria. Some wash all pickles they are handling whether they are packing dills or salt stock. This is not necessary and while advocated by some, is not to be encouraged unless the packer has an expert bacteriologist employed to innoculate his tanks. By washing, often serious spoilage may be encountered. Each fruit and vegetable has certain organisms, either bacteria or yeast, present on it which cause certain fermentations that are either helpful or which may cause spoilage. 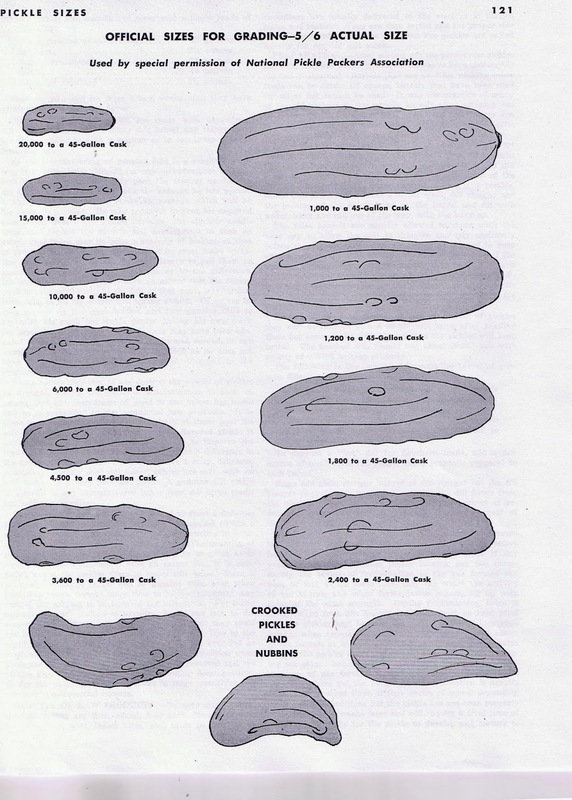 In the case of pickles, lactic bacteria are present in preponderance and will prevent spoilage, when handled properly, but if these bacteria are removed by washing, then the other bacteria will have an opportunity to develop in the brine before the helpful lactic bacteria can get a good start; thus spoilage often has a good foothold before the lactic bacteria can grow sufficiently to check it. Drain the dill weed that has been packed as above outlined and place about three pounds in the bottom of the barrel. Then fill it about one-half full of cucumbers and add one pint of mixed dill spice, eight pounds of salt, then three pounds more of the drained dill weed, fill the barrel to near the top with pickles, shake well and add the balance of the weed, dill vinegar and the balance of the spice; head up the barrel and fill with water, bung and roll out of the way, with the bung up. The filled barrels are usually allowed to stand until the next day to allow the salt to dissolve and mix uniformly before they are stacked. Barrels should be covered to keep off the heat from the direct rays of the sun, especially if the barrels are stacked in the open rather than under the tank platforms in the salting station. A temperature of 85 degrees F. is the one most favorable for the development of the lactic fermentation and to cure the pickles to best advantage. Instead of using 16 pounds of salt per barrel of pickles they may be covered with a 20 to 22-degree salt brine after heading them but some prefer a 28 to 30-degree brine as the pickles will keep better. The finished dills should test about 20 to 22 degrees salt with acidity of 0.750 per cent to keep properly. Pickles to fill barrel, fill with potable water to capacity of barrel. To produce a "hot" dill for Southern trade, add a few ounces of small dried red pepper corns (cayenne peppers) to each barrel. Some add plain vinegar instead of dill vinegar but the dill vinegar is preferable because it contains the dill flavor from the weed, it helps retard the growth and development of undesirable organisms and will assist in the development of the lactic bacteria. leaving out the bungs during the period of fermentation so the gas formed can pass off and, at the same time, they can watch the activity of the barrels and when fermentation ceases, fill up with brine of the same strength. During fermentation, brine is often forced from the barrels and they must be kept filled and the pickles kept beneath the liquor as the pickles spoil quickly when exposed to the air. It is better to put bungs in the barrels as in most cases the gas is kept in and helps to keep the pickles crisp, impart added tartness besides keeping out objectionable bacteria and give a better flavor. The pressure of gas formed is often so'great as to burst the barrels or force out the bung. This fermentation is usually terminated in about three or four weeks, of course depending upon weather conditions but the pickle has not been properly cured until a few weeks later and will require a total time of about 6 to 8 weeks for the pickle to develop and mature to its full dill flavor. The sourness, in addition to the vinegar added, is due to the lactic acid developed during the fermentation. They are fully fermented if the cell structure shows no white streaks when broken open. If they show any whiteness they should not be used until it disappears, at which time they will have the fine dill flavor and crispness that makes them so good. As mentioned before, it is not advisable to pack dills in tanks due to the great care necessary in handling and especially with the great losses if spoilage should occur. Many store the barrels of dills in the open without being covered, while others use the space beneath the floor of the salting station and between the tanks. Barrels should be stored in a shed or under cover where they do not get the direct heat of the sun. In the sun, the fermentation is often too rapid, and salt absorption may be so rapid as to cause collapse, or even softening of the pickle. • If the barrels of dill pickles are stored in the open in the sun without any covers or boards on them there will be about 10 per cent loss due to soft, spoiled dills, whereas if they are kept covered and away from the direct rays of the sun then no spoilage should occur. Dill pickles can be cured in open tanks, but great care must be observed in handling them after active fermentation ceases, otherwise spoilage will develop. Yeast will develop on the surface and must be removed to prevent decomposition and at all times the cucumbers should be kept under the brine. They should be removed from the tanks and packed in barrels as soon as possible. Salting in tanks has many disadvantages, and small tanks only large enough to hold the day's pack should be used. During the great rush in handling pickles, it may be advisable to pack in tanks; the scarcity of labor, or the shortage of barrels may necessitate their use. See that the brine is always at 22 degrees and should it fall below, add salt to bring it up to this point. Some prefer to use a 30-degree brine. As the natural acid present in dill pickles is lactic, this acid may be used instead of the 100-grain vinegar. As there is present about 0.5 to 0.75 per cent lactic acid, to produce an acidity of this amount in the finished pickles, it will require an acidity of at least 2.0 per cent in the brine that is to be added. Five barrels of salt stock, 2,400 size, should produce six barrels of finished dills. Each barrel will require about 18 gallons of a 22-degree brine to cover the pickles, 2 pounds of alum in processing, and 20 pounds of dill weed. When packed in cans, the cans are often given a coat of paraffin to prevent pinholing. Hot paraffine is poured in the cans and revolved to cover the whole interior and the surplus poured out and the can allowed to stand until the paraffin has hardened before using. The greatest loss is due to the softening of the pickles. If only well-matured pickles from which have been eliminated slippery, sweaty, soft, insect-bitten and bruised pickles, are handled rapidly with pure salt, good potable water free from impurities, then the resulting dills should have no softness. In many cases care is not taken in the selection of the raw materials used nor in the factory procedure in handling in order to produce high grade pickles. Spoilage is mostly caused by the bacillus vulgatus which belongs to the mesentericus group. This spore-bearer, often called the "potato bacillus," is difficult to destroy as all spore bearers are, especially when infection has started. To check foreign bacteria such as the "potato bacillus" starting spoilage in dills, a slight amount of acid should be added (from 0.1 to 0.2 per cent) in the form of vinegar or in the dill brine used. Once soft, slippery pickles have appeared it is impossible to save them. They should be removed by sorting and destroyed. Genuine dill pickles will not keep well in the summer so it is advisable to exhaust the supply or reduce it to a minimum so as to be almost negligible. When soft they lose their crispness and fine flavor. One can take the blossom end between the two first fingers and thumb and crush them quite easily into a soft mushy mass. Spoilage is also caused by the brine either draining off the pickles or being forced out of the barrels thus exposing the pickles to the air or at least out of the brine and permitting destructive organisms to start activity which eventually causes spoilage. Such pickles have a peculiar odor and taste, which is slightly "cheesy." When first packed for the retail trade (other than bulk in barrels), dills were sold in cans. It was customary to parafnne the cans carefully, pack the dills therein and cover with the dill brine, seal, wash the cans and label. The lids were painted with hot parafnne and cooled before being used. Test all parafinne to see that it is free from kerosene or carbon oil. On account of the acidity and salt, plain and lacquered cans would often perforate or pinhole quickly. Even with lacquered cans, there are always slight imperfections in the lacquer that are not visible to the eye but which can be clearly demonstrated by the use of the gelatin, acid, ferrocyanide mixture applied to the cans and dried. Of recent years, manufacturers are packing in glass and must take greater care in handling their product so the package will appear perfect. When genuine dills are packed in glass, instead of covering them with the original dill brine which is very "milky" a new brine is made by dissolving sufficient salt and vinegar so that it will have a 22-degree salt and a 1 per cent acidity. Some simply throw or roughly pack their pickles into jars, while others select the pickles and have them carefully packed in an almost invariably added. This brine is of the imitation order and does not have the good dill flavor of the genuine. By heating and filtering, the original brine can be used. Often where dills are placed in cans, lacquered ones are used and the brine heated to about 170 degrees F. to destroy the activity of the yeast and bacteria present. This may prevent swells due to fermentation but may not stop pinholing due to the acid action on the cans or swells due to the formation of hydrogen and known as hydrogen swells. Where the pickles are to be consumed shortly they can be safely packed in cans but where they are to be held for some time they should not be handled in cans. Glass makes a far better looking package and presents an appetizing appeal to the housewife. This flavored dill pickle can be made by adding 2 pounds of ground garlic buds for each barrel of dill pickles. This may produce too strong a garlic flavor and would suggest making an experimental pack, using 1/2 pound, 1 pound, 1 ½ pounds and the 2 pounds suggested and then selecting the one flavored properly for one's trade. Some use 12 ounces of ground garlic per barrel of pickles with success as the 2 pounds is rather strong for some. Again this flavored dill pickle is demanded by a particular class of people and can be produced by using caraway seed or if near the source of supply time, the herb can be used the same as dill herb and even packed in barrels the same as dill herb. Use 1 3/4 pounds of the caraway seed per barrel. Throw the seeds into boiling water and cook for 3 to 5 minutes until they begin to swell and then add them to the barrels when the dills are being packed. Again the amount of seed may have to be varied. Start the pack first using ½ - 1 - 1 ½ - 1 3/4 pounds of seed for each barrel. Take the genuine dills that are completely fermented, wash to remove yeast and bacteria. Cut into discs about 1/4 to 3/8-inch thick and cover with a sweet liquor containing 60 per cent sugar and 5.0 per cent vinegar. A stronger flavored sweet dill can be made by using a portion of the dill liquor, adding the necessary sugar and vinegar. This liquor should be boiled to destroy the activity of yeast and bacteria. Process, or imitation, dills can be used instead of the genuine, as they will be firmer and not so likely to break down and become soft. Make a concentrated dill brine and add the necessary sugar and vinegar to produce a sweet liquor and cover the cut pickles. From visual inspection, especially in the finished package, it is often quite difficult if not impossible to differentiate between genuine and imitation dill pickles. It may only be by tasting that the difference can be detected, and in some cases there might even be a question of doubt. Chemically the difference can be determined. Too, some packers of genuine dills make a new artificial brine to cover the pickles rather than take the time and trouble to filter the old brine in order to produce a clear, sparkling liquor. A good filter, such as is used for vinegar filtration, can be used, but it must be of non-corrosive material, as both the salt and acid cause rapid deterioration and destruction of the filter. The coarse particles should be removed from the brine by straining, preferably through cloth strainer. Imitation dills, process dills, or so-called summer dills are those made by taking salt stock that has been completely fermented by undergoing the lactic fermentation in a strong salt brine, leaching out the salt and treating with "pickle alum," adding dill weed, dill brine, dill emulsion, vinegar, salt and spices. If made properly, this pickle is very delicious, but there are many of such poor quality that they hurt the sale of all dill pickles. To make this pickle, completely fermented salt stock should be used. After sorting for size, the product should be placed in a tank, covered with water and should stand for 12 hours or overnight. Then cover again with fresh water and soak until late in the afternoon, when the water is again changed and the fresh water is heated to 130 degrees F. and allowed to stand overnight. To this last water "pickle Alum"-—ammonium alum or soda alum (sodic alumnic sulphate—S. A. S.)—is added at the rate of 1 pound per barrel of salt stock. Dissolve the alum in warm water and add it to the pickles, and see that it is mixed. The alum will make the pickles hard, and crisp them so they will "snap" when broken. If there has been no spoilage in the salt stock used, it is most unlikely that any will occur after this treatment as the cells and tissue have been hardened and bacteria cannot then break them down. Make a brine for covering the processed pickles so as to contain 30-grain acidity and 22-degree salt. Nine ounces of salt per gallon will make a 22-degree brine. In making this brine, add 4 to 5 gallons of genuine dill brine for each 150 gallons and 20 ounces of a 10 per cent dill emulsion. The more old dill brine used the better the flavor imparted. with pickles, sprinkle about 12 to 16 ounces of dill spice on top, then place some more dill weed on top, head up the barrel, and fill with the above dill vinegar, bung and stack. The barrels should stand for at least one week to age properly, and even longer is much better. Cook all together for a short time and allow to stand for several hours or even overnight, in order to leach out the dill flavor. This should produce 400 gallons of a 22-degree brine. Proceed the same as above by packing the pickles in barrels and using about 8 to 10 pounds of fresh dill weed and 1 pound of spice to each barrel of pickles. As the acidity of genuine dill pickles is from 0.75 to 1.50 per cent, then these imitation ones should have an acidity close to that. Dill flavor is obtained by adding a dill extract made either with "grain" ethyl alcohol or some other menstruum, or by using a dill emulsion, or by using dill weed. This emulsion can be made by using gums, genuine oil of dill and water, and by beating in a mayonnaise beater, in which all the parts are made of metal, to make cleaning easier. Use this method in making the emulsion: Pour the oil into the mixing bowl and add the gums. Then mix to prevent lumping, and break apart as it permits each particle of gum to be coated with oil and makes a more stable emulsion. Next, start the stirrer at medium speed and slowly add 1 gallon of hot water and follow with the balance of the water, which can be either hot or cold, preferably warm in cold weather. The use of about 1 to 2 ounces gives the desired flavor for each 200 gallons of brine. When a mayonnaise mixer with a separate oil tank is used, the water can be run in from the reservoir. "Dill Pickles, Standard Grade, should be evenly sorted, full count, good sound stock, free from hollow and slippery pickles. Package should be well filled, properly graded and stencilled as to size. Good sound cooperage." The only reference to quality is "good sound stock, free from hollow and slippery pickles," but nothing is. mentioned about imitation dills or salt stock dill or of acidity and salt or flavor. "Pickles, Dill, are made by the natural lactic fermentation in brine, of cucumbers with dill plant and/or dill oil with or without the addition of other spices and the finished product contains not less than five-tenths per cent (0.5%) lactic acid nor less than four per cent (4.0%) of salt." "Pickles, Dill, Process or Imitation (Summer Dill) are made by treating salt stock cucumbers or pickles with dill plant or dill oil or both, with or without the addition of a vinegar and with or without the addition of other spices." It is manifestly unfair to the packers of genuine dills to have to compete with packers of imitation dills on the same common ground without some protection. There is no objection to the sale of imitation dill for what they are. In fact, some imitation dills are better than poor genuine ones. They certainly should be labeled properly, and, unless they are, no doubt some prosecutions will compel different labeling. Sauerkraut juice is being sold for cocktails and is being advertised extensively. Being a natural aperient, it contains lactic acid (lactic bacteria and some yeast). It has a sharp, acid taste that is both palatable and appetizing. The lactic acid which it contains aids digestion and regulates the removal of waste material from the body, stimulates the normal action of the intestines and prevents the growth of harmful bacteria which cause auto-intoxication. To read the above paragraph one would think that kraut juice was being discussed, but such is not necessarily the case. The same qualities that have been applied to kraut juice can also be applied to dill juice. It is pleasantly acid with a fine spiced dill flavor which will appeal to some in preference to kraut juice. While this product is not being sold commercially, there is no reason why it cannot be placed on the market the same as kraut juice and be given the same high position that has been accorded kraut juice. There is an opportunity for some progressive firm to start a new product on the way to high national honors. Since we are now having campaigns on orange juice, tomato juice and kraut juice, why not dill juice? As cucumbers contain about 3.0 per cent sugar, then if completely fermented the brine should contain about 1.50 per cent lactic acid and the salt, varying, of course, but usually containing from about 20 degrees to 22 degrees (equivalent to from 5 to 6% per cent salt). Only genuine dill juice should be used, only from high grade dill pickles with a good flavor. No flat, insipid, off-taste juice should be packed. Do not use imitation dill liquor or a mixture of genuine and imitation juice. Do not use the juice from soft or spoiled dill pickles because the juice will no doubt be infected with organisms that have already produced an off-taste. dill flavor when they reach their destination. They have a poor dill flavor, are quite salty, can scarcely be eaten and have no lasting good taste. Really such packers are more guilty of perpetrating a fraud with their product than those who pack an imitation dill, and should be prosecuted whenever they can be detected. The packer of imitation dills does go to considerable trouble to turn out a palatable product, but the other class seem to be only interested in selling their pickles to those who must try later to dispose of them by using them as ordinary salt stock when they have paid a higher price for dills. The same care that is observed in handling kraut juice should be practiced in packing dill juice. It would be well to pack a few bottles or cans with the dill juice and process to note the effect of heat on the flavor before packing on a commercial scale, as some juices develop an off-taste. Like kraut juice, dill liquor should not be filtered to remove all of the suspended matter, but just strained to remove any solid particles of pickle, weed, bung, wood, etc. By filtering to produce a clear, brilliant product the resulting drink will not have as good a flavor because filtering removes considerable of the palatable flavor. Again, do not attempt to use old dill brine—that is, the brine from pickles that have been packed for about a year—but try and pack the brine in the fall after the pickles have completed their full fermentation and have the fresh, full, pleasing dill flavor and aroma in addition to the snappy acid flavor. Can or bottle the product as near its normal natural state as possible. Do not heat with live steam running into the product, but either heat in a non-corrosive kettle or glass-lined tank equipped with coils in order to prevent discoloration, and dilution of the salt, acidity and flavor as well as the introduction of objectionable materials from the steam lines. Heat as low as possible before filling into containers and process at about 160 degrees F. for a short time. The juice should be easy to sterilize because of the relative high acidity and salt which affects the pH number so that sterilization can be easily accomplished. Also the organisms present are usually non-spore-bearing and can easily be destroyed at low temperature, thus making it easier to handle notwithstanding the great number of bacteria present. It has been demonstrated that products containing an acidity even lower than that of dill juice can be sterilized easier than those that are neutral or slightly alkaline. If the dill juice cannot be bottled or canned the same day in which it is drawn from the pickles, then it should be placed in barrels and bunged tightly to prevent the formation of yeast scum and growth of wild yeast and other organisms. If the quantity is not sufficient to fill barrels then heat to about 160 degrees or 170 degrees F. to destroy activity. Dills, sweet, sour and mixed pickles, as well as special pickle products are packed mostly in glass, partly no doubt due to the sales idea that the housewife prefers seeing the finished product before she buys. It is superfluous to state that all glass used for packing pickles should be washed so that dust, dirt and debris as well as any free alkali will be removed. It often requires a little ingenuity to properly arrange the pickles and other vegetables packed with them, to show up to best advantage because many packers are not quality producers but think only of sales volume and quantity production. But with the many new and beautiful glass packages offered for sale now, there should be an incentive to pack quality goods. The cap selected should be picked for appearance, service and ease in opening. The proper liner should be used so the packed product or the vinegar from it will not come in direct contact with the metal of the cap and cause perforation. Of course, some caps are given an extra heavy coat of enamel which may protect and reduce or even prevent perforation. Many of the caps used on jars of dill pickles contain a felt back liner and an "oiled" paper disc which will protect and prevent "pin-holing." Packers of pickles in cans are apt to have more difficulty due to perforation, hydrogen swells, off-odor, and taste, discoloration, etc. than if packed in glass. However, many of the difficulties encountered are blamed on the cans when the trouble may be due to the raw material used, method of handling, improper sealing, and the can maker is often unjustly condemned or criticized. Lacquered cans should be used by all means especially for sweet, sweet mixed, relish, sour pickles and dills, although plain cans are used successfully for dills. Due to high acidity in the pickle products, plain cans are easily attacked, thus dissolving tin and imparting a metallic taste and often forming flippers or hydrogen swells, or even causing perforation. There is also the danger of dissolved iron after the tin coating has been dissolved and the pickles may turn black after being opened. The syrup or brine before being added to pickles should be heated to at least 190 degrees F. or the cans and contents should be heated in an exhaust box until the center of the cans shows a temperature of 170 degrees F. before sealing. This temperature should be sufficient to form a vacuum after the cans are cooled and thus prevent springers. There are some who sterilize the pickles they pack in cans by processing them a short time in boiling water. If so the cans should be cooled thoroughly to prevent softening of the contents. When sweet mixed pickle is packed, due to the cauliflower present, there may be a formation of hydrogen sulphide. This gas may also be produced should there be other sulphur compounds present such as from lime-sulphur sprays or Bordeau solution which may have been used in spraying for insects and not thoroughly removed during the handling. Excess copper may be present in the brine or liquor and cause "greening" of pickles. This copper may have accumulated or have been picked up along the various steps involved. The sugar used in making the sweet liquor may contain an excessive amount of copper. Then the vinegar used may have been pumped through brass lines and the valves used to regulate the vinegar flow are also brass, which dissolves copper and zinc to such an extent as to impart a "puckery," astringent taste. There may be some who cook the sweet liquor in copper kettles from which the tin coating has been somewhat re- moved, leaving some exposed copper and this will add considerable copper to the sweet liquor. Again copper dippers may have been used to dip the sweet liquor. The greatest danger in discoloration is due to the presence of large amounts of dissolved iron which may be present to start with in the cucumbers themselves, and accumulate from the salt, and water used. More may be picked up in the processing tanks from the iron pipes and also from the iron scale in the steam lines. The pickles contain some tannin and in the presence of iron, upon exposure to the air or oxygen, black pickles will occur unless the iron is kept down to a minimum. soluble pigment which discolors the brine and pickle. To produce quality foods it is necessary that only high grade raw materials be used and handled in a sanitary manner and as scientifically as possible. These results show that when genuine dill pickles are covered only with a salt brine, they will still have sufficient acidity to be passed as genuine dill pickles. I have seen so many many recipes and instructions for making authentic garlic dill pickles, that I thought it rewarding to post the authentic method for the manufacture of this food delight. My pickle pix are below. I cannot help but smile as I post the picture below. I saw this today at a thrift store and it sure does look nice. But the recipes call for vinegar and that's a no-no if you want real fermented dill pickles.